Delhi - Chandigarh - Shimla - Dharamsala - Amritsar - Delhi. On arrival at international airport in Delhi, our representative will greet you and transfer to the hotel. Delhi, the capital of kingdoms and empires is now a sprawling metropolis with a fascinating blend of the past and the present. It is a perfect introduction to the composite culture of an ancient land. Overnight in Delhi. 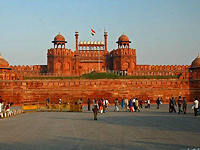 After breakfast we start our full day sightseeing of the walled city called Old Delhi and the cosmopolitan New Delhi. Old Delhi pulses with energy and color, the hustle and bustle of thronged bazaars laced by a maze of narrow lanes twisting and turning between the tall, leaning houses full of the sights, sounds and aromas of the Indian subcontinent. You will visit Jama Masjid with its tapering minarets and wonderful marble domes. In Old Delhi you will also have an opportunity to enjoy a rickshaw ride. After lunch, we explore New Delhi, its wide boulevards offering ever changing perspectives of Lutyen's landscaped city. It is a city known for its formal parks, magnificent Parliament Building, the Rashtrapati Bhawan (the official residence of the President of India designed by Sir Edwin Lutyens) and the India Gate. In New Delhi you will also visit Qutab Minar, the 72.5 m high tower dating back to 13th century and Humanyun's Tomb (built in the 16th century and architecturally the fore runner of the Taj Mahal). Overnight in Delhi. After early breakfast transfer to Delhi railway station to board train for Chandigarh. Upon arrival at Chandigarh railway station in the late morning, transfer to hotel. Chandigarh is a city and a union territory in the northern part of India that serves as the capital of the states of Haryana and Punjab. As a union territory, the city is ruled directly by the Union Government of India and is not part of either state. The city of Chandigarh was the first planned city in India post-independence in 1947 and was known internationally for its architecture and urban design. 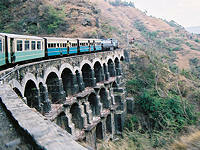 After breakfast, drive to Shimla, the capital of present Himachal state and the summer capital of British India during raj times. 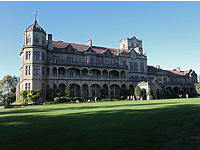 The city still retains many of its colonial buildings in a variety of architectural styles, such as the Viceregal lodge, Command House, Gaiety Theatre, Town Hall, and Christchurch on the ridge. In the afternoon we will arrange one hours 'Toy' Train ride within the city. 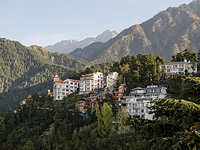 After breakfast we will start a Heritage walk of Shimla by walking through the town's Architectural Heritage Zone to see the various architectural sites from the British era. Most of the buildings are still in use. Christ Church, The Ridge, Bandstand, Gaiety Theater, Scandal Point, Railway Board Building, Gortan Castle & Viceregal Lodge amongst others. Overnight in Shimla. After breakfast we set of for the drive to Dharamsala (about 6 hours). 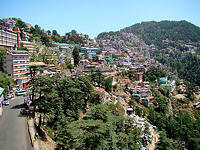 Dharamshala is a city and a municipal council in Kangra district in the Indian state of Himachal Pradesh. It was formerly known as Bhagsu. The Dalai Lama's residence is here in the suberb of McLeodGanj. On arrival at Dharamsala check in to the hotel and rest of the day at leisure. Overnight in Dharamsala. After breakfast visit the Tibetan Institute of Performing Arts (TIPA) which was founded by Tenzin Gyatso, the 14th Dalai Lama on reaching McLeod Ganj in exile from Tibet in August 1959. It was one of the first institutes set up by the Dalai Lama and was established to preserve Tibetan artistic heritage, especially opera, dance, and music. In the afternoon, visit Kangra Valley, a popular tourist destination lying on the southern spur of Dhauladhar in the valley. It is home of the Masroor Rock Cut Temple, also known as Himalayan Pyramids and a possible contender for UNESCO World Heritage status. Overnight in Dharamsala. After breakfast we set off for Amritsar which is the spiritual centre of the Sikh religion and home to the Harmandir Sahib (commonly known as the Golden Temple), the Sikh spiritual and cultural centre. This important Sikh shrine attracts more visitors than the Taj Mahal. Upon arrival in Amritsar, transfer to hotel. 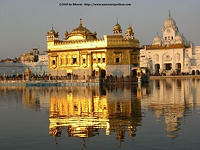 In the evening witness the Palki ceremony, which takes place in the Golden temple twice daily. The ceremony we will witness is when the holy book Guru Granth Sahib is carried to its special room for overnight. This is symbolic gesture. After prayers and singing, the book is closed placed in a golden palanquin which is carried by devotees who are lined up to take Seva. The same ceremony is performed again in the morning when the Guru Granth sahib is taken back to the Temple and opened. Overnight in Amritsar. After breakfast, we take a city tour with the blessings at the Golden Temple. In the afternoon we visit Jallianwala Bagh, where, on April 13, 1919, British soldiers opened fire on an unarmed forbidden gathering, killing hundreds of civilians. In the evening witness the flag down ceremony at Wagah border. Breakfast at hotel. Later transfer to Amritsar airport for flight to Delhi, Upon arrival at Delhi airport, connect with flight for return to UK or onward destination. This journey up into the foothills of the Himalayas can form part of your Indian odyssey.